Playing the piano with expression. Musical phrasing expresses the soul of the music. A phrase in music is like a sentence when you read. It's a part that belongs together, that expresses a musical idea, thought, question or answer. In between each part we «breathe». For a singer or a wind instrument player, this means literally to breathe, but for a pianist it means to shape each phrase with a beginning and ending, and lifting our wrists and arms gracefully between each phrase; to «breathe». Sometimes you have to do this very quickly, and sometimes with a slower movement. Here you will learn how you can play with more expression and beautiful phrasing, with simple but effective step by step exercises! Playing with beautiful phrasing involves some technical work, like learning how to move and lift your wrists and arms. But mostly it's involving work with really feeling the ebb and flow of each phrase, and working towards bringing out the sound of what you want to be heard. Playing a beautiful legato with a «singing» tone. Playing a gradual crescendo and diminuendo. Learn specific arm and wrist movements to begin and finish each phrase. Here are 3 exercises. Practice each exercise separately, then combine the 3 techniques for a beautiful musical phrase! Learn the notes to an easy melody and memorize it. Play the notes slowly, legato. Listen to the sound «between» the notes. This should be connecting each note with the next like singing. No “air” between the notes, neither overlapping. Just a flowing continuous melody. You can try singing, or humming along as you learn to both hear and feel it. Learn to do this with each hand separately, as well as both hands playing in unison. Start with a simple five note scale, one note for each finger. Imagine each note being a number from 1-5. 1 being the softest, lightest you can play, and 5 being the loudest, heaviest you can play. Play the first note as 1 (softest). Imagine the number 2 being one unit heavier. Continue like this letting each finger getting louder than the previous up to 5. Play the scale back down again getting gradually softer in the same way. Learn this with both hands separately and together in unison. Also learn to do the opposite, play from loud to soft. 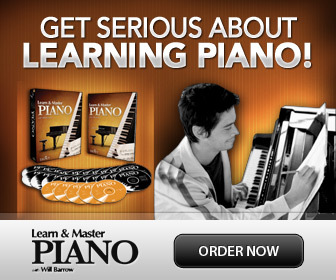 This movement is at the foundation for all piano playing. By mastering this movement, you will be able to play with a beautiful tone and musical phrasing much easier. Lift arms and hands with loose wrists and dropped hands. Drop down hands and arms on the keys, landing on the tips of your fingers in the rounded hand position, balancing the fall with flexible wrists. Finish each movement by “rolling” hands arms and wrists forward and up from the keyboard. Remember to get into the habit of never finishing a phrase or a piece by pulling your hands down from the keys. Always up, with the wrists first! Wave “bye-bye” with your hands like a baby. Observe your wrists. Put your hands in your lap and relax. Now lift your hands with the wrists first. Hands and fingers dropped. Shake them and imagine water drops coming down the finger tips. Now, drop down your hands in your lap. Land on your fingertips in a rounded hand position. Let the wrists catch the fall by bouncing a little, but staying in alignment with the arms. You don’t want the wrists to bend or being too loose. Practice this also on a table top and on the keyboard. Hands separately and both. Finally, let’s combine the different parts! Select a short phrase from an easier piece you play. Decide where the peak is, this is the most important note in the phrase. Usually you will find this about 2/3 in the phrase. You will make a crescendo until there and a diminuendo after. Mark that in your score, if it’s not already written. While learning the notes, you have heard the melody. Now, sing or hum it without playing. Or just imagine someone else singing it. “Hear” it in your head. Prepare your hand position on the keyboard, then lift your wrists as you breathe in, let them drop on the fingertips to start playing (Breathe out slowly while playing). Play legato and crescendo to the peak of the phrase, (listen listen!) then diminuendo to the last note of the phrase. Now “roll forward, up and away” from the keyboard with your arms and wrists as you breathe in. Did you enjoy playing with musical phrasing? Let me know how this exercise went in the comments below!